Yippee Ki-Yay, Christmas movie fans! Die Hard might just be the greatest action film ever made. It's endlessly quotable, made a huge movie star out of Bruce Willis, features one of the penultimate performances from the late Alan Rickman, and launched not only a franchise, but a slew of imitators, as well. Welcome to the party, pal! 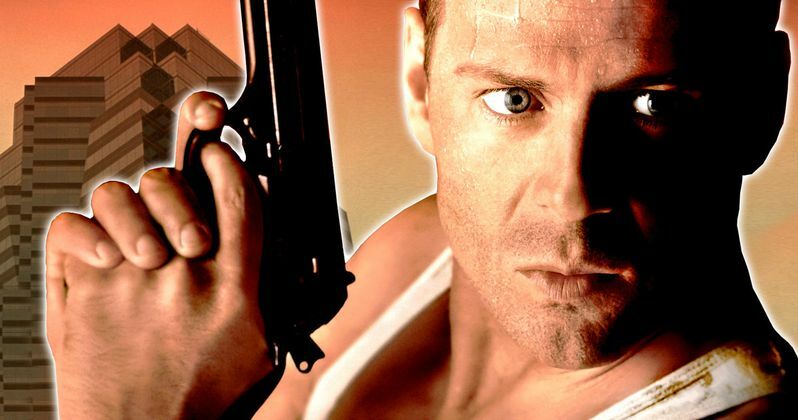 Here we look at 10 things you never knew about Die Hard. Frank Sinatra could have been John McClane. Ol' Blue Eyes had first dibs on the role that made Bruce Willis an action star. Die Hard is based on the 1979 crime novel Nothing Lasts Forever, which was a sequel to the 1966 book The Detective. The famous crooner turned actor starred in the 1968 film adaptation of The Detective and was therefore offered the chance to reprise the role of John McClane in the follow-up. Of course, Sinatra was already 73 by then, and said no. At one point Clint Eastwood considered starring in a movie version of Nothing Lasts Forever. As the project developed, a number of man's man actors reportedly turned down Die Hard: Sylvester Stallone, Robert De Niro, Harrison Ford, Nick Nolte, Mel Gibson, Richard Gere, Don Johnson, Burt Reynolds, and Richard Dean Anderson. Die Hard was Alan Rickman's first feature film. Though he'd done television, including Shakespeare for the BBC, Alan Rickman had yet to star in a feature film when he was cast as Die Hard's main villain, Hans Gruber. Reportedly, Sam Neill passed on the gig. Die Hard's casting director offered the role to Rickman after seeing him in a stage production of Dangerous Liaisons. That Teddy Bear should get an agent. The teddy bear we see John McLane bringing for his kids for Christmas belonged to John McTiernan. The director used it again in 1990's The Hunt for Red October. Die Hard is the reason Bruce Willis says 'What?' a lot. Director John McTiernan favored extra loud gunshots, which is just one of the many details that made Die Hard look and sound so much more real than most action movies of its day. Unfortunately, during the scene where McLane shoots a bad guy from under a table, the loud bang of the blanks left permanent damage. As Willis explained to The Guardian in 2007, "Due to an accident on the first Die Hard, I suffer two-thirds partial hearing loss in my left ear and have a tendency to say, 'Whaaa?'"